Women's Business Weekend returns to Asheville, November 9 - 10. Nothing is more powerful than women joining together in true mutual support and cooperation. 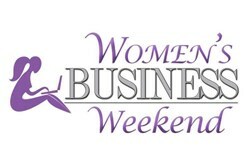 Women’s Business Weekend will take place on Saturday and Sunday November 9th and 10th from 10 am to 6 pm, at 60 North Market Street Asheville, NC. There will be six panels, live music, breakout sessions, a cocktail hour, networking opportunities, and more. For tickets and more information, please visit: http://www.womensbusinessweekend.com. Produced by Daniele Martin and Nicole Gianturco, Women’s Business Weekend is designed to deeply impact the women who participate and the businesses they run. This year’s conference will explore “Embracing a Relationship Driven Economy.” The practice of business is evolving and today’s businesses do not thrive alone. Interdependent entrepreneurs and businesses create a thriving local community particularly for women. “Nothing is more powerful than women joining together in true mutual support and cooperation,” says Martin. Social Capital and the Future of Finance with Jane Hatley of Self-Help Credit Union, Pete Krull of Krull and Company, Missy Sherburne with DonorsChoose.org, Desiree Adaway of the Adaway Group and Kendra Turner of KP Turner Consulting. This panel promises to be a lively discussion around understanding and exploring non–profits, the emergence of social impact business models and best investment practices for women. Autonomy, Empowerment and Entrepreneurship with Kara Errickson of SkinFare, Christi Apodaca of C & Co. Naturals, Keri Evjy of Healing Roots and Design, and Julie Wishart of Green Bamboo Cleaning Supplies. These pioneer women will explore the varying degrees of confidence and connection within one's self as fuel to fire in entrepreneurial success. Sponsors include JB Media Group, Mountain BizWorks, Short Street Cakes, Mojo Coworking, and The Market Place. For additional Sponsorship opportunities, please contact womensbusinessweekend(at)gmail(dot)com. To learn more and share in the excitement, please visit: http://www.womensbusinessweekend.com and http://www.facebook.com/womensbusinessweekend.